The term correlation is a combination of two words ‘Co’ (together) and relation (connection) between two quantities. Correlation is when, at the time of study of two variables, it is observed that a unit change in one variable is retaliated by an equivalent change in another variable, i.e. direct or indirect. Or else the variables are said to be uncorrelated when the movement in one variable does not amount to any movement in another variable in a specific direction. It is a statistical technique that represents the strength of the connection between pairs of variables. Correlation can be positive or negative. When the two variables move in the same direction, i.e. an increase in one variable will result in the corresponding increase in another variable and vice versa, then the variables are considered to be positively correlated. For instance: profit and investment. On the contrary, when the two variables move in different directions, in such a way that an increase in one variable will result in a decrease in another variable and vice versa, This situation is known as negative correlation. For instance: Price and demand of a product. A statistical technique for estimating the change in the metric dependent variable due to the change in one or more independent variables, based on the average mathematical relationship between two or more variables is known as regression. It plays a significant role in many human activities, as it is a powerful and flexible tool which used to forecast the past, present or future events on the basis of past or present events. For instance: On the basis of past records, a business’s future profit can be estimated. In this equation, a and b are the two regression parameter. A statistical measure which determines the co-relationship or association of two quantities is known as Correlation. 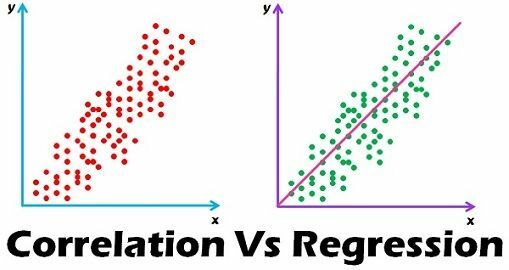 Regression describes how an independent variable is numerically related to the dependent variable. Correlation is used to represent the linear relationship between two variables. On the contrary, regression is used to fit the best line and estimate one variable on the basis of another variable. In correlation, there is no difference between dependent and independent variables i.e. correlation between x and y is similar to y and x. Conversely, the regression of y on x is different from x on y. Correlation indicates the strength of association between variables. As opposed to, regression reflects the impact of the unit change in the independent variable on the dependent variable. Correlation aims at finding a numerical value that expresses the relationship between variables. Unlike regression whose goal is to predict values of the random variable on the basis of the values of fixed variable. With the above discussion, it is evident, that there is a big difference between these two mathematical concepts, although these two are studied together. Correlation is used when the researcher wants to know that whether the variables under study are correlated or not, if yes then what is the strength of their association. Pearson’s correlation coefficient is regarded as the best measure of correlation. In regression analysis, a functional relationship between two variables is established so as to make future projections on events. It is worth appreciating ! The way of expressing is very clear and to the point ! I thank you ! Nice Explanation, It’s very clear.. It clears up my confusion. Thanks! An increase in price leads to the decrease in the demand for commodity, and that is why, they are negatively correlated. This was fabulous. My doubt is completely clear. Very useful and knowledgeable article. Thank you, It is very useful. very simple to understand. Its now crystal clear to me. Thanks for explaining the difference thoroughly with proper points. In statistics, it’s very important to understand each and every concept clearly so as to work properly. I am studying R and faced the difficulty to understand. I am glad that ur this piece of write up helped me to understand the concept. You should write more often in statistics also, and keep up the good work. Is it possible to use correlation for binary data?